In June 2015, The Hubby and I traveled for 5 weeks through 8 different countries, exploring historic sites, taking in breathtaking views, and indulging in delicious local cuisines. So delicious and indulgent, that I gained a pound per country, souvenirs that I still carry with me today. The last stop on our journey was 36 packed hours in Bangkok. 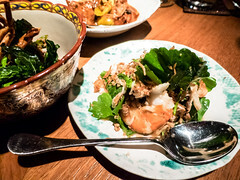 Landing in the afternoon, I had booked dinner at Nahm our first night. We then had 24 solid hours to tour the city before flying out early the next morning. 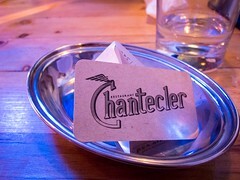 To help streamline our time, we booked a private tour guide for the day and joined a food tour that night. 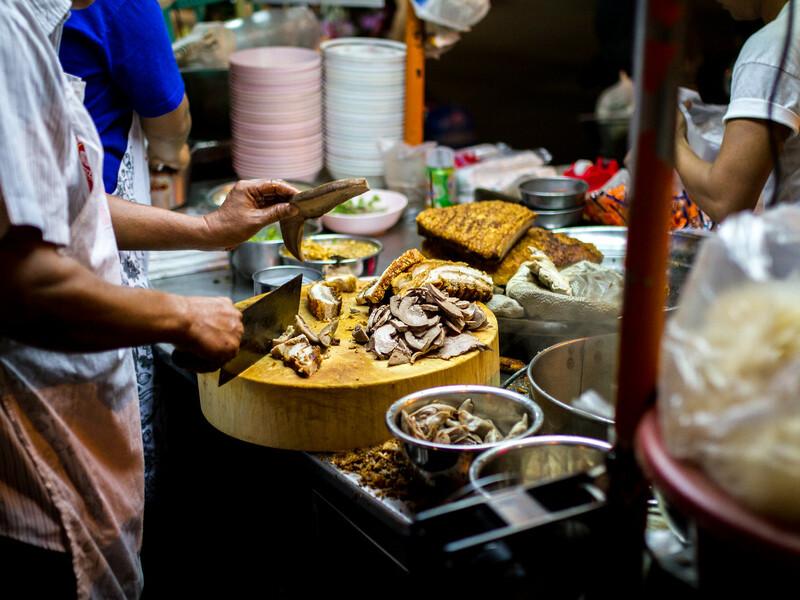 I had first read about Bangkok Food Tours on the Tiny Urban Kitchen blog and their Yaowarat Street Food Tour (Chinatown) fit our itinerary perfectly. 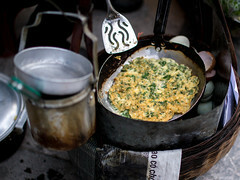 I also contemplated the Midnight Tour by Tuk Tuk, but was worried about catching our morning flight the next day. 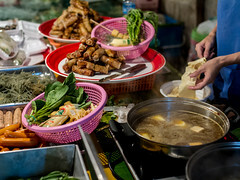 If I had more time in Bangkok, I would have definitely tried the full day Floating Market tour. Before deciding to book a tour, I had researched where to go and thought about exploring the city ourselves. However, I was worried about time, finding hidden vendors and possible language barriers. There was also just so many things I wanted to try. By choosing to go with a tour, we were trusting local experts to make our lives easier and we had a great time. Our tour ran from 6pm-9:30pm and cost ~ $50/person with 7 stops. 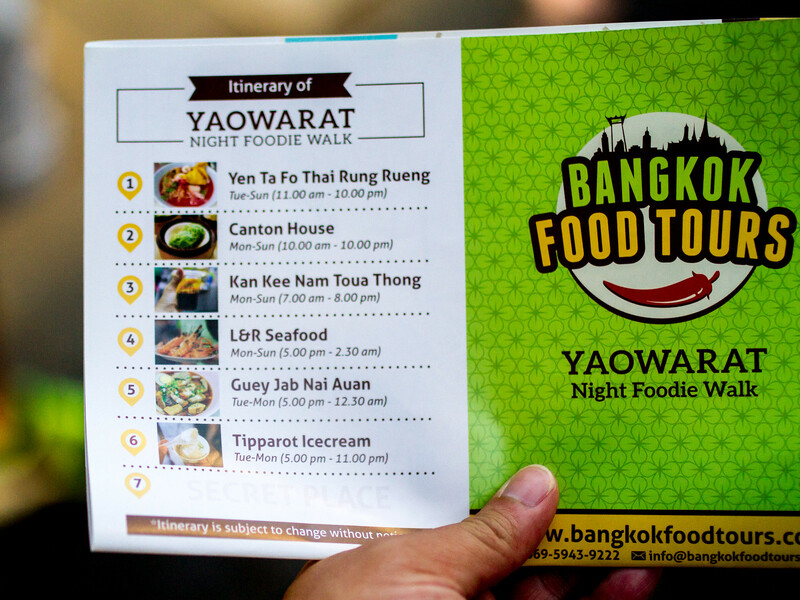 The tour would take us through Yaowarat, Chinatown, home to many of Bangkok’s famous street foods. Although there was a set itinerary, ours changed right off the bat to accommodate a restaurant closure. I don’t have the names of all spots we hit, but each was unique and tasty. 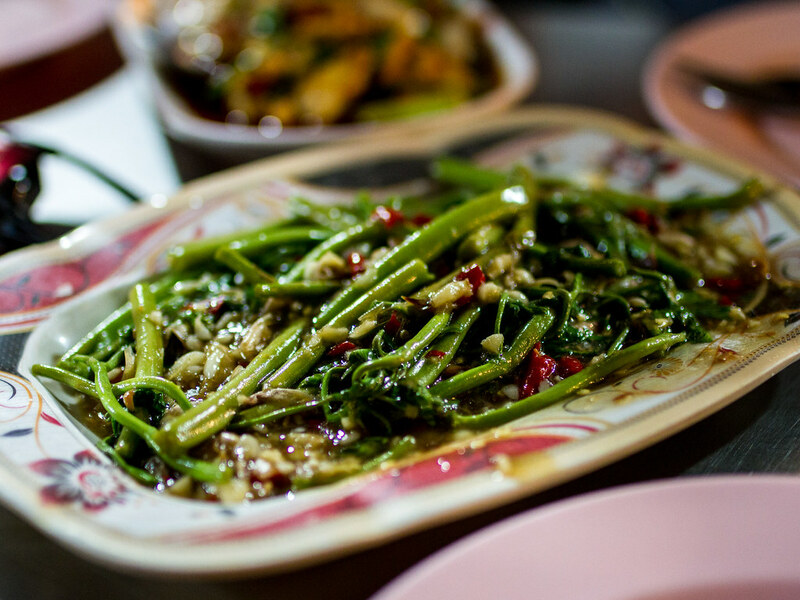 Since Bangkok was the last stop of our South East Asia adventure, we had become familiar with certain ingredients (like pandan and durian) and weren’t as wowed as some of our tour mates. Also, perhaps because we were in Chinatown, many of the flavours were already familiar. 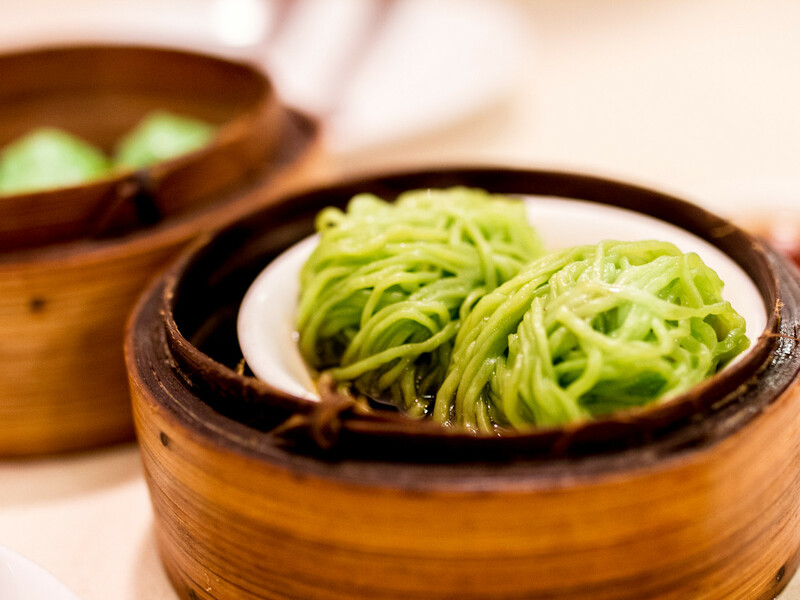 Canton House – Thai style dim sum featuring pandan noodle dumplings and pandan leave siu mai. 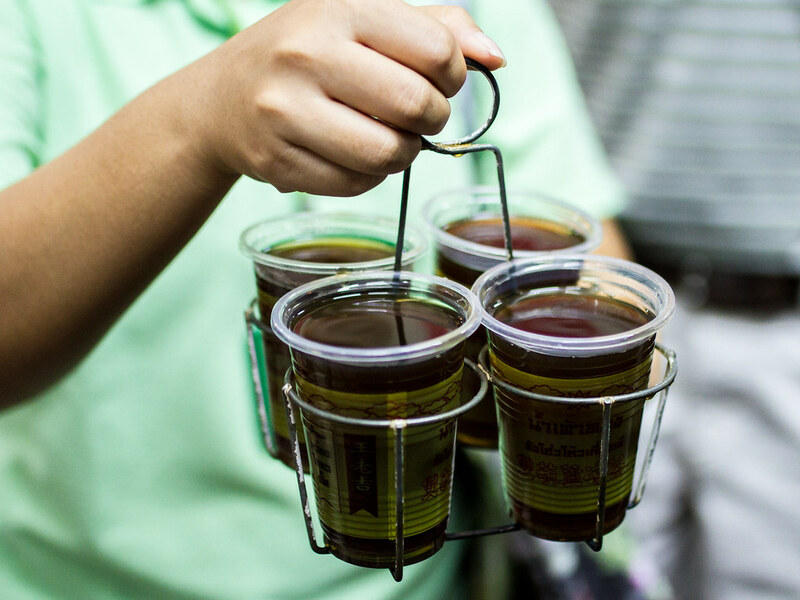 Kan Kee Nam Toua Thong – Famous tea stand serving sweet chrysanthemum tea and an incredibly bitter herbal drink. The herbal tea is popular in the summer as it’s “cool” and help balance out the “hot” in a person. I had one sip, but could not handle any more. The Hubby has had experience with Eastern herbal medicine and had a few more sips than me. I much prefered the floral chrysanthemum tea. 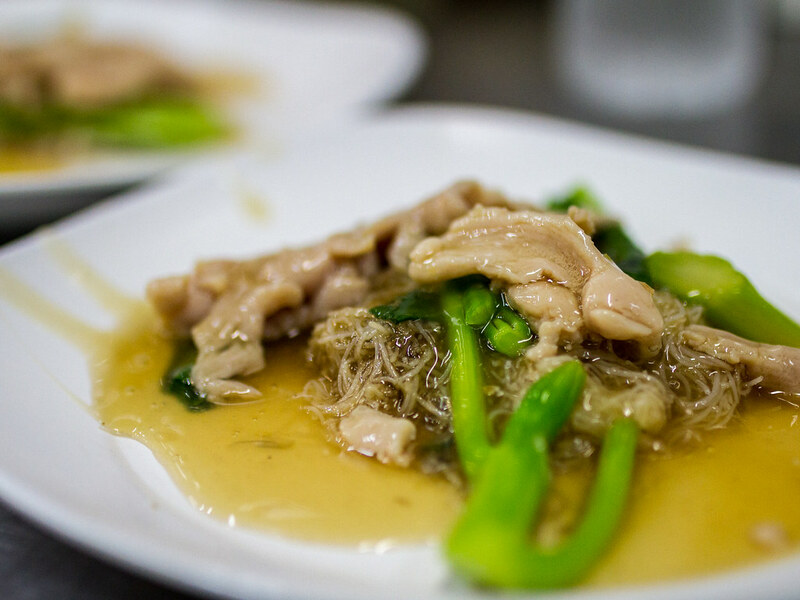 Noodle Stall – Stir fried noodles with chicken and Yu Choy. 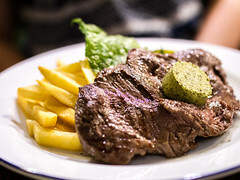 A simple dish but amazing, especially the gravy. 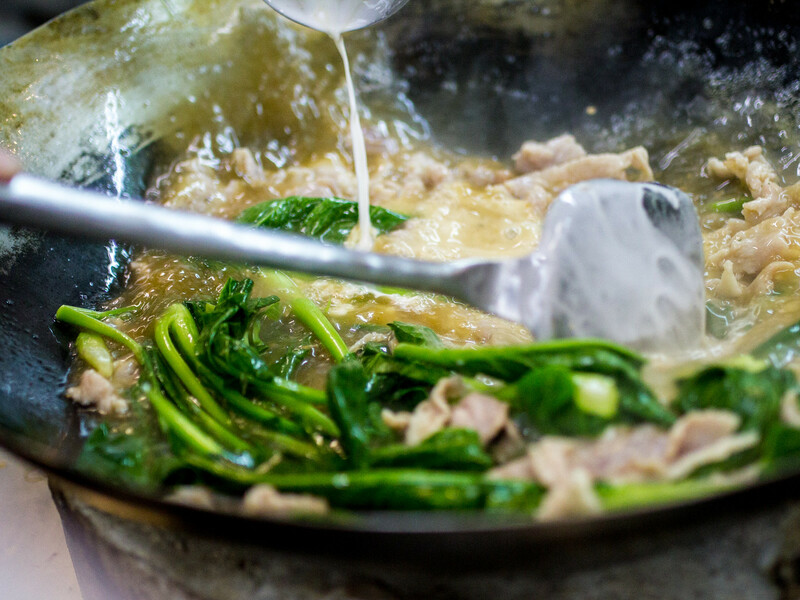 Standing on a stool over a hot wok, the owner fries up noodles to order. This is the only dish the shop sold and it was the only one needed. 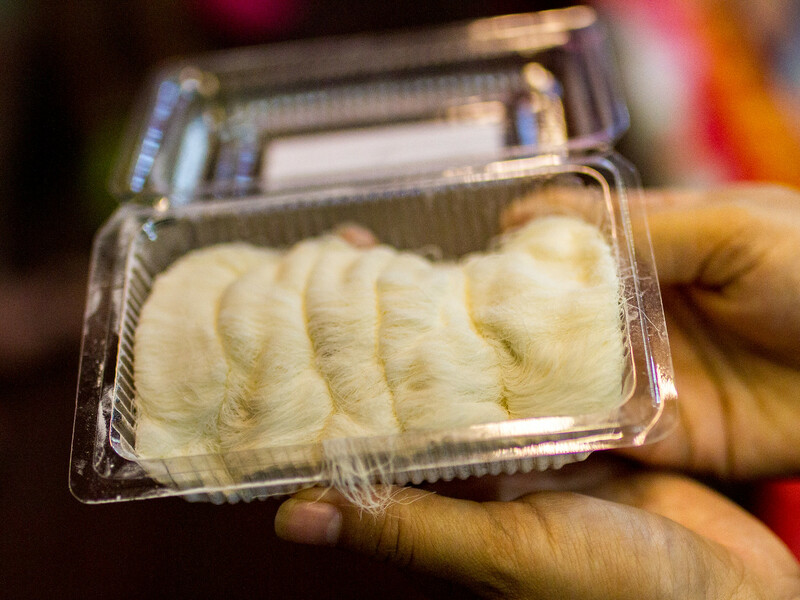 Dragon’s Beard Stall – Along the way to our next stop, we walked by a sand making fresh Dragon’s beard candy. A few of our tour mates were fascinated by the long strands of candy and our guide picked up a pack for everyone to taste. L&R Seafood – This was a famous seafood food shop that has spawned many competitors in the neighbourhood (like R&L Seafood). 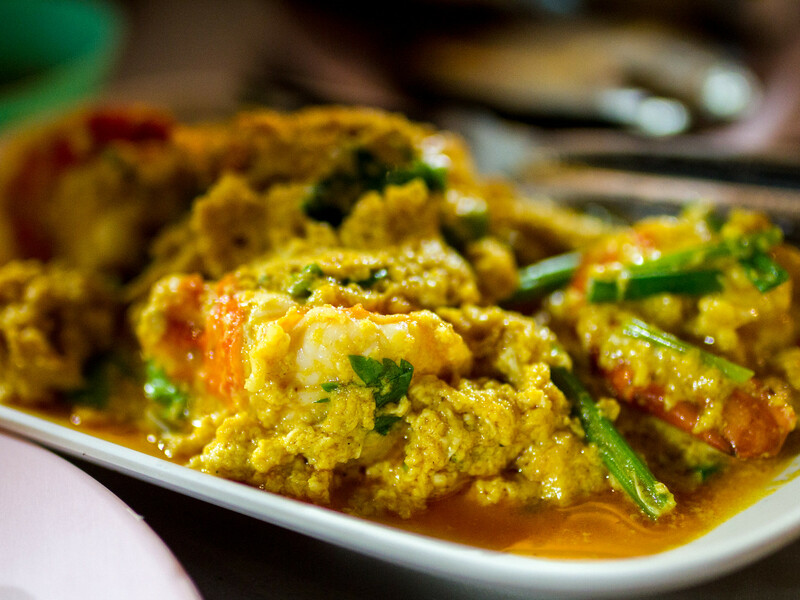 We tried a curry shrimp, stir fried water spinach and scallops. 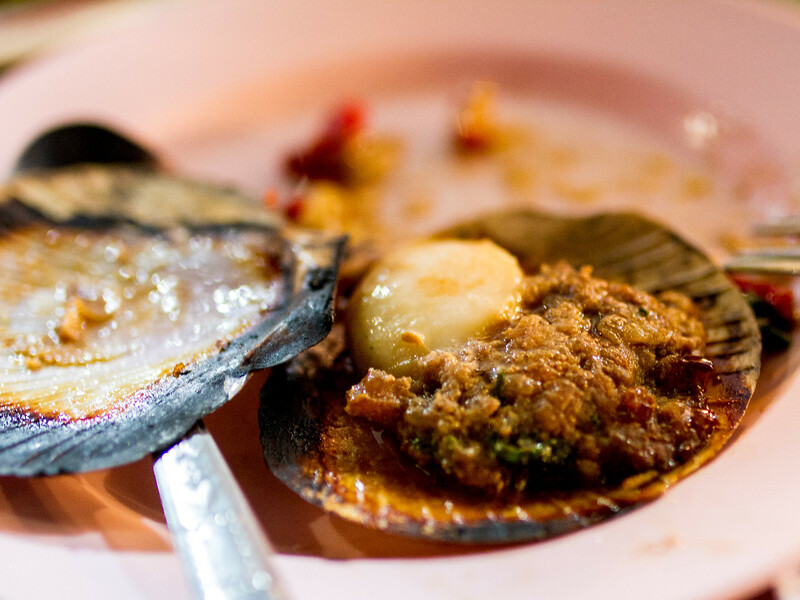 The seafood tasted sweet, fresh and was seasoned with strong flavours. I would’ve loved to try more dishes. 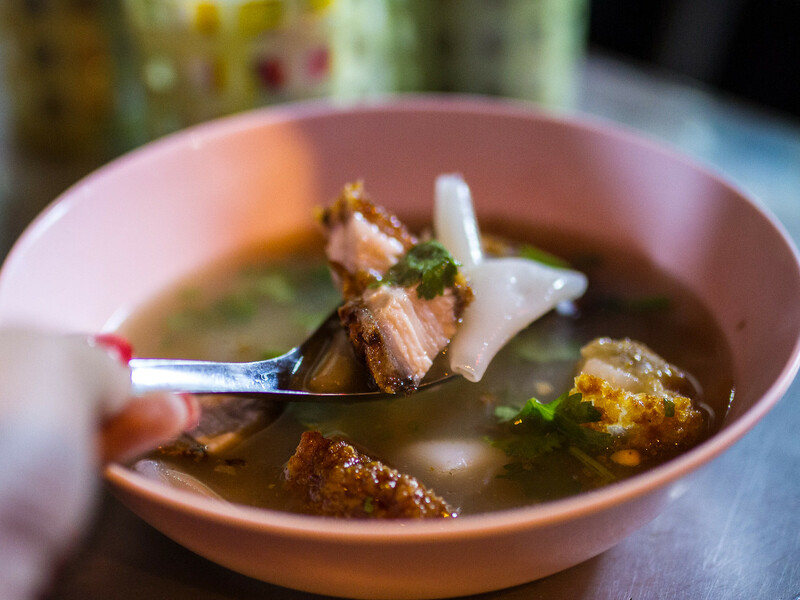 Black Pepper Soup Stall – Rolled rice noodles in a peppery pork broth and topped with roast pork. 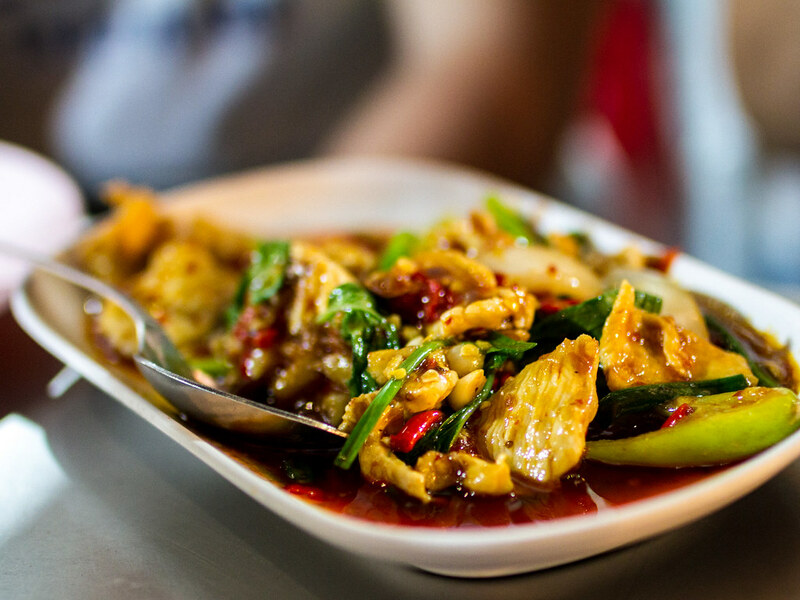 I really enjoyed the strong, spicy broth and the chewy texture of the noodles. 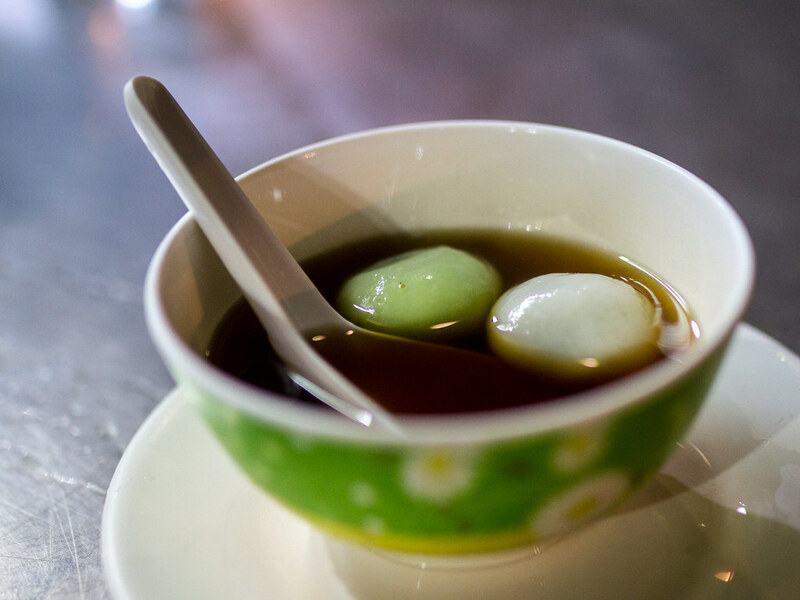 Tong Yong – The last two stops were both sweet ones, starting first with a bowl of tong yuan, glutinous rice balls. 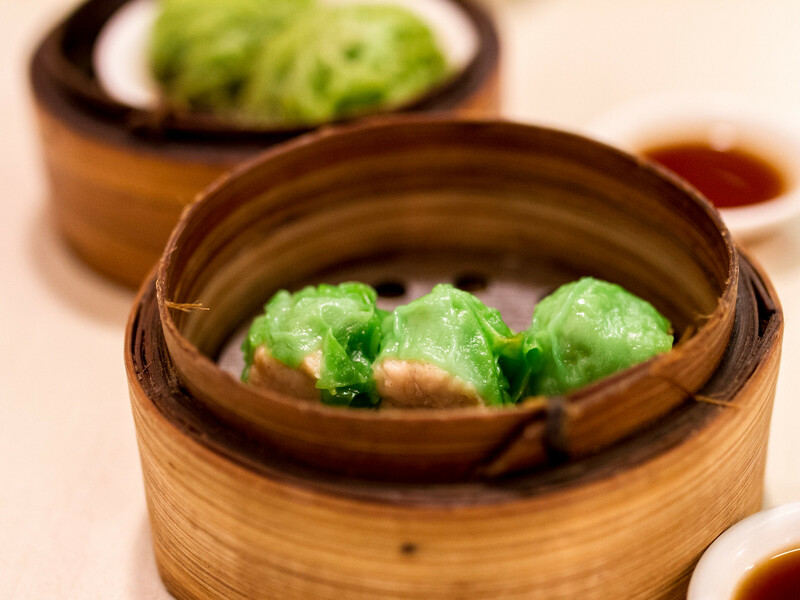 Filled with black sesame or peanut and served in a sweet ginger broth, tong yuan is one of my favourite Asian desserts.